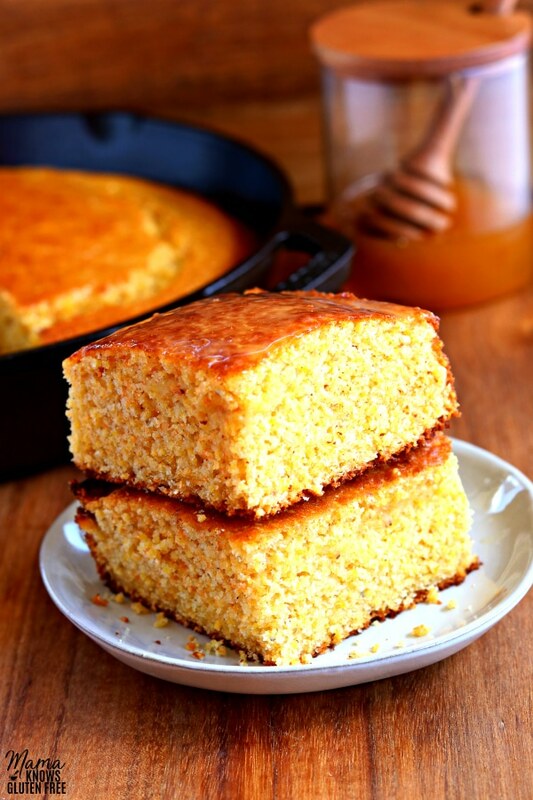 An easy gluten-free sweet cornbread recipe made Southern style. The recipe also has a dairy-free option. My husband is from Tennesee, and he grew up eating cornbread. One of the Southern recipes I learned to make when we first were married, was cornbread made with buttermilk. I like my cornbread sweet so I added sugar and honey to my recipe. My recipe for sweet cornbread was super easy to modify to be gluten-free. It was just as easy to make it both gluten-free and dairy-free when we both went dairy-free a few years ago. There are several brands of gluten-free cornbread mixes, like Krusteaz and Martha White, and I have tried them both. They are good, but I promise my homemade gluten-free cornbread recipe is just as easy to make and tastes so much better! It only takes a few simple ingredients to make homemade cornbread. I always have gluten-free flour on hand and a bag of gluten-free cornmeal makes several batches of cornbread. Making cornbread from scratch is super easy. It’s an easy quick bread recipe that can be made in one bowl and baked in 20 minutes. The first step is to make your own buttermilk. To make the buttermilk add the milk and white vinegar to a small bowl and stir to combine. Allow the milk mixture to sit for 5 minutes to make buttermilk. Pre-heat oven to 425°F and grease an 8″x 8″ square baking pan or 8″ cast iron skillet with gluten-free cooking spray. Add the gluten-free flour, gluten-free cornmeal, baking powder, baking soda, and salt and mix together until combined. I used Pillsbury gluten-free flour for this cornbread recipe. It is my favorite cup for cup gluten-free flour blend. A cup for cup flour blend is one that already has xanthan gum it. Cup for cup (or 1 for 1) flour blends makes gluten-free baking so much easier! Make sure you do not add any extra xanthan gum to your flour if it already has it in it. If you do, you will get super gummy cornbread! If you are using a gluten-free flour blend that does not have xanthan gum in it, you will need to add 1/4 teaspoon of xanthan gum to the recipe. Not all gluten-free flours are created equal. You may experience different baking results depending on the gluten-free all-purpose flour blend you choose. I have found the best way to measure gluten-free flour is the “spoon & level” method. Using a large spoon scoop out the flour into a measuring cup. Then use the back of a knife to level off the top of the measuring cup. Please do not scoop the flour directly out of the bag with a measuring cup. I have also included a dairy-free option to my gluten-free cornbread recipe. My husband, youngest son, and I are also dairy-free. So I always try and have a dairy-free option for my recipes. For the dairy-free option, I use Smart Balance butter and almond milk or cashew milk. Now you can also enjoy gluten-free and dairy-free cornbread. Cornmeal is naturally gluten-free because it is made from dried corn kernels, but not all packaged cornmeals are gluten-free. Cornmeal is often produced by manufacturers who also process wheat on their machinery and cross-contact can easily occur during manufacturing. It is safest to buy cornmeal that is labeled gluten-free. I buy Arrowhead Mills or Bob’s Red Mill gluten-free cornmeal. Cornbread should be stored in an air-tight container once it has completely cooled. It can be stored at room temperature or refrigerated. Yes, you can freeze cornbread. Cut the cornbread into squares and place it in a freezer-friendly, air-tight container. If layering the cornbread, place parchment paper between the layers to avoid it sticking together. Defrost the cornbread by letting it sit at room temperature for 30 minutes. Reheat in the oven or microwave. 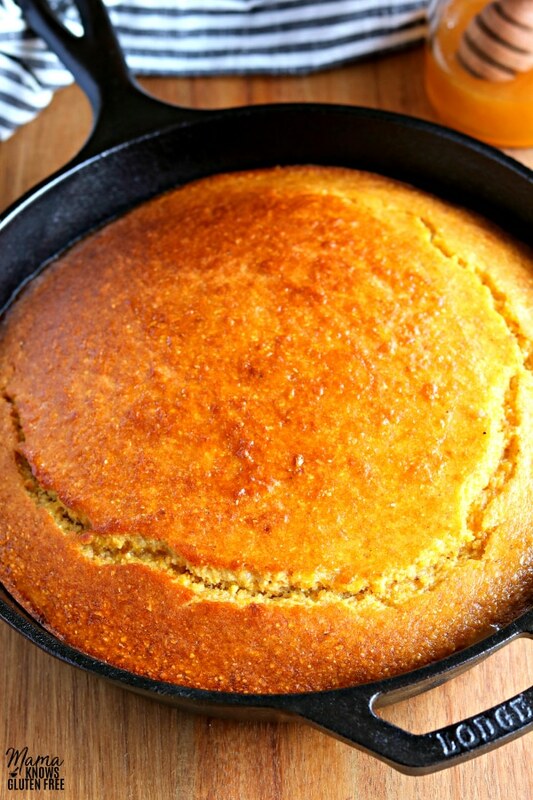 Cornbread is great topped with butter, honey or jelly. I like to brush my cornbread with melted butter when it first comes out of the oven before I slice it. This easy homemade gluten-free cornbread is the perfect bread to serve with soups, Beef Stew, and chili, but it also goes awesome with my Crispy BBQ Chicken Thighs. It can also be eaten for breakfast! 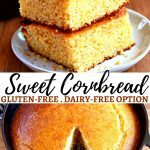 This recipe for gluten-free cornbread is so easy that you won’t go back to the boxed gluten-free cornbread mix once you try it! It’s sweet, and the texture is the perfect balance between soft and firm. 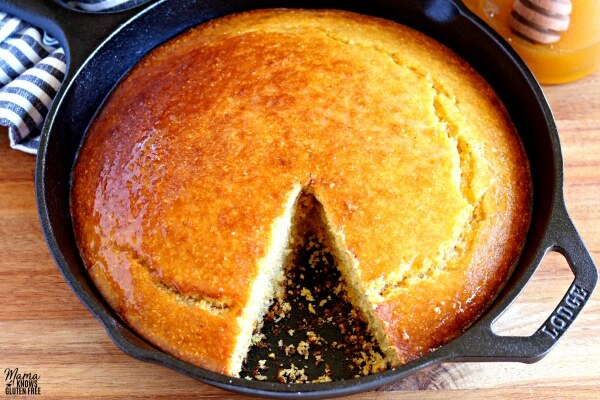 Cornbread should not fall apart when you pick it up but should melt in your mouth. It’s super easy to make and can be eaten with dinner or for breakfast. More Gluten-Free Bread Recipes To Try! Add the milk and white vinegar to a small bowl and stir to combine. Allow the milk mixture to sit for 5 minutes to make buttermilk. Pre-heat oven to 425°F and grease an 8"x8" square pan or 8" cast iron skillet with gluten-free cooking spray. In a large bowl beat together the eggs, sugar, and honey. Pour in the melted butter and buttermilk and mix until fully combined. Pour the batter into the greased baking pan or skillet. Bake for 20-25 minutes until a tester inserted into the middle of the cornbread comes out clean. Remove the cornbread from the oven and let it cool for 10 minutes before serving. Store leftovers in an air-tight container. If you are using a gluten-free flour blend that does not have xanthan gum you will need to add 1/4 teaspoon to the recipe. 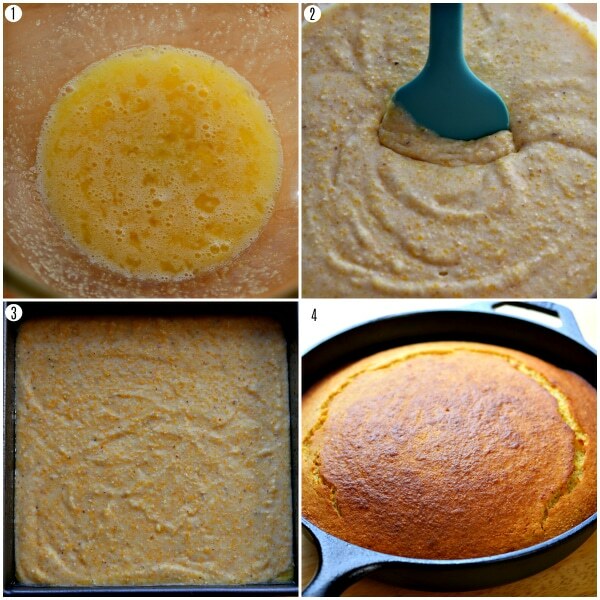 Freeze the cornbread by cutting it into squares and placing in a freezer friendly air-tight container. If layering the cornbread, place parchment paper between the layers to avoid it sticking together. Defrost the cornbread by letting it sit at room temperature for 30 minutes. Reheat in the oven or microwave. Made this today and delicious. Looking for great other new something recipes and this does it. Thanks for sharing. 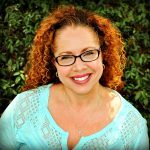 Thank you so much Vivian for the wonderful 5-star recipe review! I am so happy that you enjoyed the cornbread. You are so welcome, I love sharing what I make for my family. Thank you again! 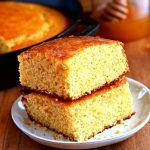 I love the sweetness of this cornbread but sometimes need a less sweet cornbread for cornbread dressing. If I cut back to a couple of tablespoons, do you think this recipe would work for the cornbread dressing? Hi Pam! Yes, this cornbread would work perfectly for cornbread dressing. Cutting back on the sugar will help it be more savory, but I would leave the honey in the recipe because I really like the flavor it adds. Please let me know how your cornbread dressing turns out. I hope you enjoy it. Thanks! Could I use all honey instead of sugar? Would it make any difference? Hi Melissa! I am not sure, the sugar not only sweetness the cornbread but helps keep it moist. All honey may do the same thing, I have just not tried it. I do bake with honey when I do make some of my muffins and it turns out well. If you try it with all honey, please let me know how it turns out. Thanks!